Graphic cigarette warning labels in Southeast Asia and Taiwan: Are they effective? Cigarette boxes from Taiwan (far left), Malaysia (center), and Singapore (far right). Guidelines for pictorial warnings vary considerably from country to country. Over the past three months I’ve amassed a few cigarette boxes from my travels with large warning labels that — when placed side by side — string together a grotesque gauntlet of images ranging from gangrene-ridden feet to cancerous mouth sores (not all of which I’ve blessed your eyes with above). 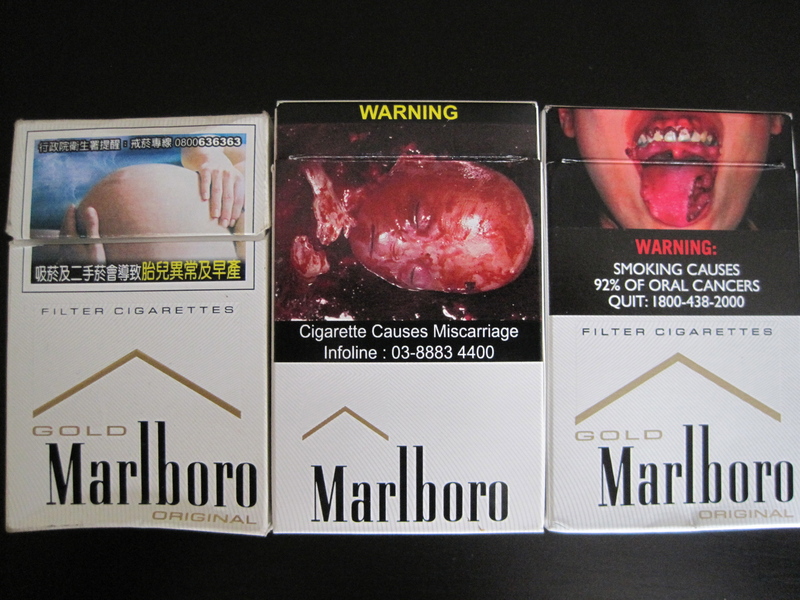 First implemented in Canada in 2001, pictorial warnings on cigarette boxes are now enforced (note: a good source of warning images) in a handful of Southeast Asian nations: Thailand (2005), the Philippines (2010), Singapore (2004), Brunei (2008) and Malaysia (2009). Taiwan (2009) is currently the only country in North Asia requiring such images. With pictorial warnings slated to be introduced in the US this September — and a pile of samples sitting right in front of me — I began to wonder whether or not their implementation in Asia has fruited any results. In most patriarchal Asian cultures, the male portion of society still tenaciously cling onto their cigarettes. Smaller countries in the region (Cambodia and Vietnam, for example) aren’t quite ready to actively confront their habit yet, while others have skirted around full use of pictorial warnings thanks to the assiduous urging of the tobacco lobby. Economic juggernauts South Korea, Japan and China carry only text warnings. China has such bedded interests in smoking that decline in tobacco sales would likely hurt domestic investment: construction of the Canton Tower in Guangzhou was largely financed by a state-run tobacco company. It turns out that private interests may have some reason to be concerned. According to a 2009 study by the Society of Research for Nicotine and Tobacco on the effects of text warnings in Malaysia, smokers who already forgo cigarettes regularly are twice as likely to quit. However, some participants were “non-significantly” effected even when they thought about the harm of smoking. The same bulletin also suggests that a more visual format may have great potential in countries with high illiteracy rates. ve already been confronting smokers in parts of Asia for several years with little record of their success, as of the time of writing. This could be because Asia is still widely a smoker’s haven: in open-air restaurants, ashtrays come wedded with utensils as a due courtesy. Some experts claim that the effects of such policies should be measured in the long-term. But I foresee a greater problem occurring by then: people will have already become conditioned. Indeed, smokers I know in Thailand and Taiwan tend to ask salespeople to pick out their favorite brand — along with their favorite warning picture. There are further reasons to doubt the impact of graphic pictures. In selecting the six images to be placed on boxes in Malaysia, officials had trouble finding smoking victims with Freddy Krueger-esque afflictions. In the end, they decided to borrow the required images from Singapore and Thailand. This syncs up nicely with popular suspicions of smokers: the images being force-fed to them are representative of a very select few. To some, they even appear faux in nature — perhaps Photoshopped. The most effective tool against smoking may be economical and social pressure. In countries where a pack of cigarettes effectively taxes your future health bills and all public areas ban you from smoking, life is tough. A picture may say a thousand words, but warning images could use extra help in Asia to reach the goal they’re intent on. For a vivid look at the effects of smoking on the body, check out this great infographic. Thank you for the great post. Anyway take it easy and keep the great work!